For a beer geek who lived in Quebec for a fair bit, I never tried Dieu du Ciel until this past fall when my friend Dallas came in from Regina sporting several beers I've either never tried, or never heard of. Dieu du Ciel is undeniably one of the best breweries in all of Quebec, a province known for having some of the best breweries on the planet! 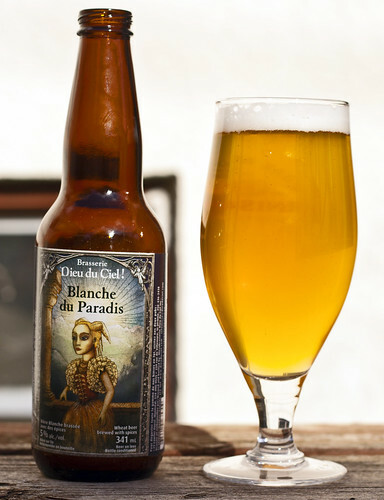 As you already likely know, I reviewed Route des épices already, so now it's time to check out their Blanche du Paradis (or White from Paradise). Appearance: Pours a hazy light orange colour. If you are familiar with witbiers already, you know that they almost always have a nice orange colour. This is no exception. Has a nice amount of white-as-snow foam, slowly diminishes. I love all kinds of beers, but I have a special place in my heart for witbiers, so I'm excited! Aroma: Nice abundance of citrusy goodness. Lots of orange, a bit of possibly apricot or peach, slightly lemony and some coriander. Very much your standard witbier, which means.. it will be tasty! Not overly sweet, but not too subtle either. Taste: Better than Unibroue's Blanche de Chambly in bottles, but about nearly identical to Chambly on tap. It has some sweetness from a balance of orange and apricot, and that floral/coriander zing that us witbier fans have known to love. The sweetness is subtle but it really hits the back of the tongue. Not much really to say here.. if you know what Blanche de Chambly tastes like, you know what this tastes like (but slightly more citrusy). Overall Thoughts: Solid witbier by the folks at Dieu du Ciel. I wish this was available in Manitoba. Maybe one day, or else I'll have to drive into Regina to pick some more up. I like the nice citrusy aroma, very ideal for a warm spring day like today. This is a patio kind of beer, enjoying with wings or your favourite pub grub and having good times while enjoying the weather. The taste isn't overly sweet, neither is it overly subtle either.. it's there. I like it.. it reminds me of pub hopping in Quebec City.. I miss those days! Blanche du Paradis has an ABV of 5%.